iPhone X vs iPhone 8: which Apple phone is for you? The iPhone 8 is out now, but while it’s new and has a new number in the name, it’s not Apple’s top flagship. That honor falls to the iPhone X, a phone so new it’s not even out yet. You can pre-order now and it's set to come out on November 3. And it’s a very different phone to the iPhone 8. While – if you were feeling blunt – you could call the iPhone 8 more of the same from Apple, the iPhone X is packed full of new tech from an all-screen front to the Face ID scanner. To give you a clear picture of just how different these two phones really are we’ve put them head to head, comparing their design, display, power, camera, battery and price. From the back or side you might not see too much difference between these two phones. They both have a glass back and a metal frame and both are available in Space Grey or Silver (though the iPhone 8 is also available in Gold). But flip the phones over and the difference is obvious. The iPhone X has a screen-filled front with just a tiny notch at the top housing its fancy new camera, while the iPhone 8 has large bezels above and below the display, with the lower one housing the home button and Touch ID fingerprint scanner – a feature lacking from the iPhone X. Other differences come in the form of their weight and dimensions, as while the iPhone X is 143.6 x 70.9 x 7.7mm and 174g, the iPhone 8 is 138.4 x 67.3 x 7.3mm and 148g. So the iPhone X is longer, wider, thicker and heavier than the iPhone 8, but not by as much as you might expect given the size of the screen (more on that below...). One key way in which the phones are the same, though, is their dust and water resistance, as both the iPhone X and iPhone 8 are IP67 certified, meaning they can be submerged in water up to 1 meter deep for up to 30 minutes. The iPhone X has a 5.8-inch bezel-less screen, which is the biggest display Apple has ever put on an iPhone and far, far bigger than the 4.7-inch screen on the iPhone 8. Size isn’t the only difference between them either. The iPhone X has a 1,125 x 2,436 resolution for a pixel density of 458 pixels per inch, while the iPhone 8 is 750 x 1,334 and 326 pixels per inch. And the iPhone X also has an AMOLED display – that technology being the same as Samsung uses in the likes of the Galaxy S8 - while the iPhone 8 has an LCD one. The switch to AMOLED leads to deeper blacks and richer colors, and the iPhone X also can show HDR content, which the iPhone 8 can't (although it does, oddly, support it). But both phones sport True Tone technology, allowing them to automatically adjust their white balance based on your surroundings and improve the picture. We can’t compare these phones without talking about how you unlock them, as that’s one of the key differences. The iPhone 8 uses the familiar Touch ID fingerprint scanner, built into a circular home button, while the iPhone X uses facial recognition, with a new system called Face ID. Apple has hyped this up in a lot of ways, claiming it’s fast, reliable and secure. We’ll let you know exactly how it stacks up when we’ve put the iPhone X through a full review, but along with the screen it’s one of the main new features and one of the main differences from the iPhone 8. It’s also worth noting that Face ID is instead of Touch ID, not in addition. There’s little difference in terms of power between these phones, as both the iPhone X and the iPhone 8 run iOS 11. However, the way you interact with the phones differs slightly, as on the iPhone X there are gesture controls in place of the physical home button found on the iPhone 8. Both handsets also have a hexa-core A11 Bionic chipset, so power should be similar, though the iPhone 8 has 2GB of RAM, while reports suggest there’s 3GB in the iPhone X, which could give it a performance boost. We won't know how much RAM is in the iPhone X until we see some teardowns of the product after it's released, but it'll make sense for Apple to include more RAM in the top-end phone. The iPhone X has a 12MP dual-lens camera incorporating both a wide-angle and a telephoto lens, while the iPhone 8 has a 12MP single-lens camera. Both phones sport optical image stabilization, a quad-LED flash and an f/1.8 aperture on their main cameras, but the extra lens on the iPhone X allows it to optically zoom and to use Portrait Mode, which blurs the background of an image to emphasize the foreground. Both phones have a 7MP f/2.2 front-facing camera, so they’re similarly equipped there, but the iPhone X again has some extra skills. Portrait Mode works here too on the X, and it also supports ‘Animoji’, which are essentially emoji that are animated based on your facial expressions and mouth movements. As for battery, thanks to teardowns we now know there’s an 1,821mAh one in the iPhone 8. No-one’s been in a position to take an iPhone X apart yet, but reportedly that has a 2,716mAh cell. For Apple’s part, the company has said that the iPhone X lasts up to 2 hours longer than the iPhone 7, while we found in our review that the iPhone 8 lasts about the same amount of time as the iPhone 7, so in theory you should get more juice from the iPhone X. We won't know for certain which one has the best battery until we get to properly test the battery on the iPhone X in our upcoming full review. Whichever phone you choose though you’ll get access to fast charging and - thanks to that glass back – wireless charging. This is another big difference between the two phones and one that might push you away from Apple’s flagship, as the iPhone X starts at $999 / £999 / AU$1,579 for a 64GB model, rising to $1,149 / £1,149 / AU$1,829 for a 256GB one. You can now pre-order the iPhone X and you can find a selection of the best deals we've seen in the US here and in here for the UK. The iPhone 8 meanwhile isn’t cheap, but it’s the far more affordable option, starting at $699 / £699 / AU$1,079 for 64GB and going up to $849 / £849 / $1,329 for 256GB. You can also buy the iPhone 8 right now and we've put together our favorite deals for the US here and here for the UK. 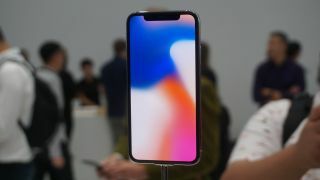 Apple’s iPhone range has never been more varied, and while there’s still not something for everyone, its two main new phones are likely to appeal to very different buyers. On the one hand there’s the iPhone X, with cutting-edge tech and features, a completely new look, a big screen and a high price to match. While on the other there’s the not-quite-top-end iPhone 8, which should feel similarly slick in use thanks to iOS 11 and its A11 Bionic chipset, but is more compact and visually what you might expect from an iPhone, as well as costing a fair bit less. Which is best - and whether either one is worth the money - will be a question we can answer when our final iPhone X review is finished.